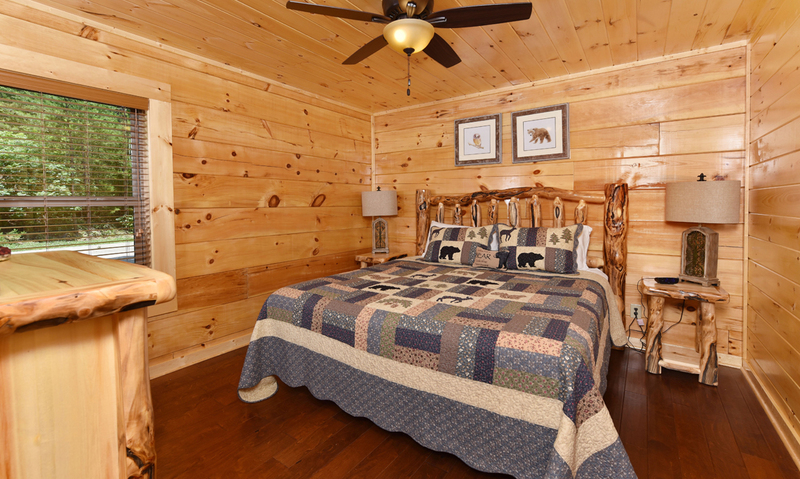 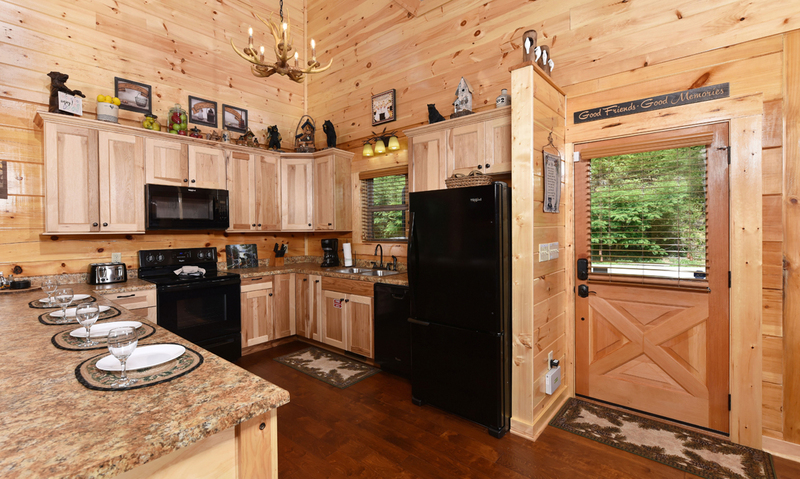 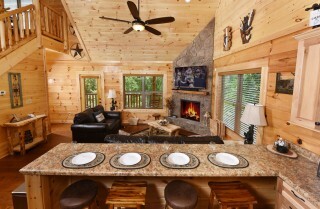 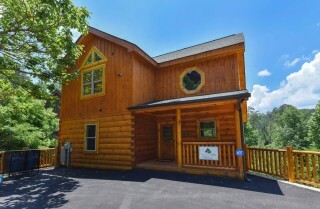 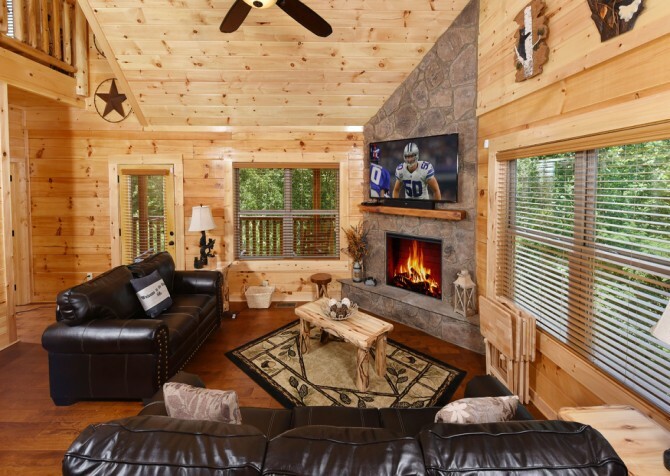 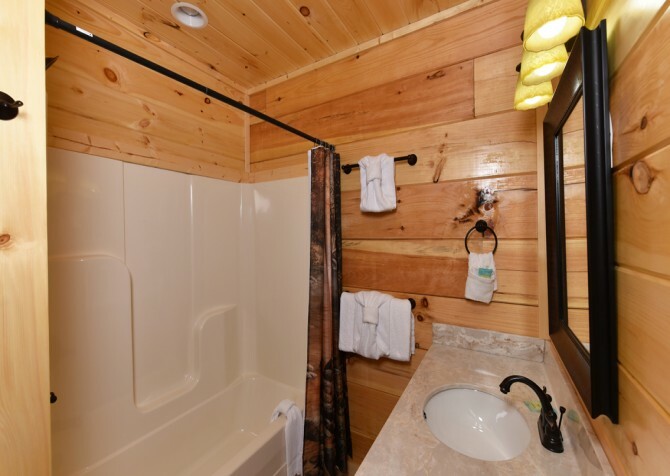 Situated in the convenient Bear Creek Crossing Resort, Charlie Brown’s Cabin is a gorgeous, log-style new build — completed in 2018 by premier luxury log home builder Botkin & Cole — less than 5 miles from the Parkway in Pigeon Forge! 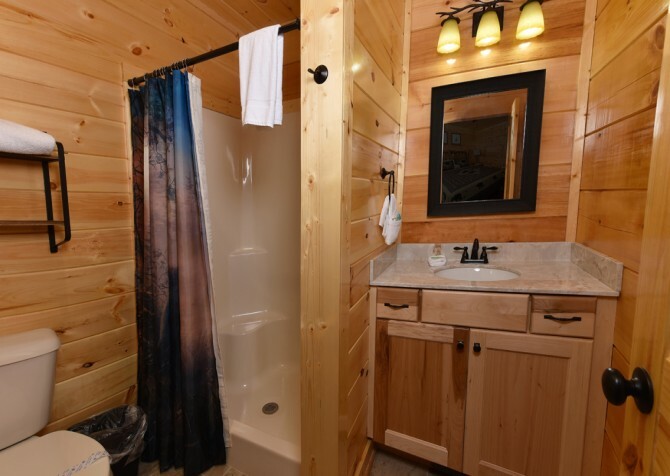 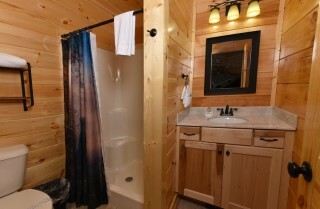 The roomy 1,700-square-foot cabin has 2 bedrooms and a loft, 3 full bathrooms, and space for 6 guests. It’s a lovely retreat from everyday stresses for up to 3 couples or a family wanting to enjoy the serenity of nature. Throughout the cabin, its blend of casual elegance and rustic charm is paired perfectly with modern amenities and the comforts of home. 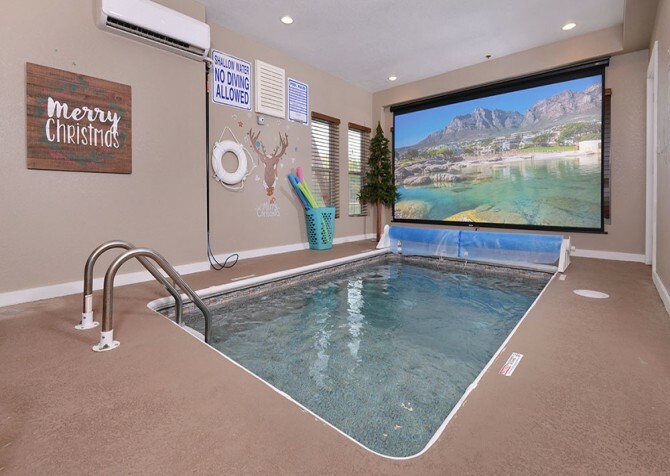 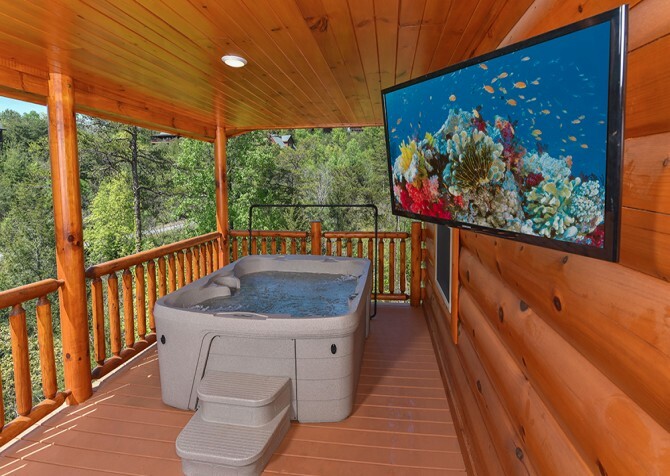 Host movie night with the big screen HDTV, play games and unwind in the loft, soak in the mountain and tree-studded views from the hot tub, churn out homemade meals in the fully equipped kitchen, and snuggle with your spouse in a king-size bed. This home has even been furnished and decorated with many pieces from local and regional artisans and craftsmen! It’s is a true Smoky Mountain gem! 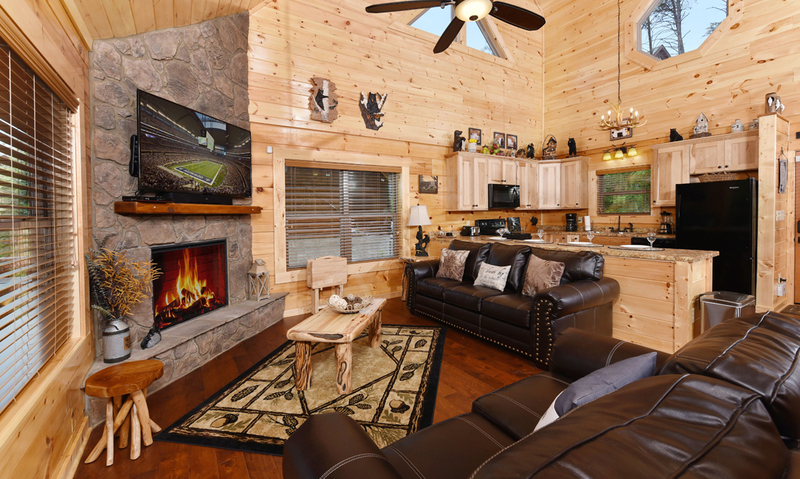 Cozy up in the living room at Charlie Brown’s Cabin, which showcases a cathedral ceiling, electric (heated) fireplace in stone, comfy leather sofa and loveseat, and handy remote-controlled ceiling fan. 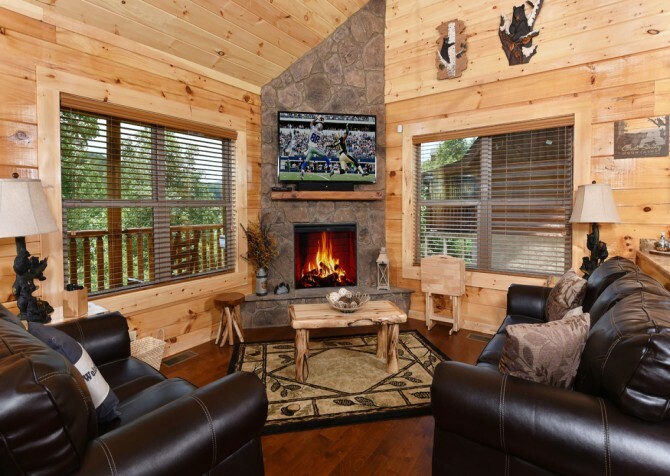 Stay entertained with snacks piled high on the log coffee and side tables and a feature film or the big game on the 60-inch HD flatscreen TV with DirecTV and sound bar. Whether waking up with a cup of joe, chatting with friends about in-town adventures, or reading a good book until dawn, the great room is a cozy space for all morning, noon, or night! 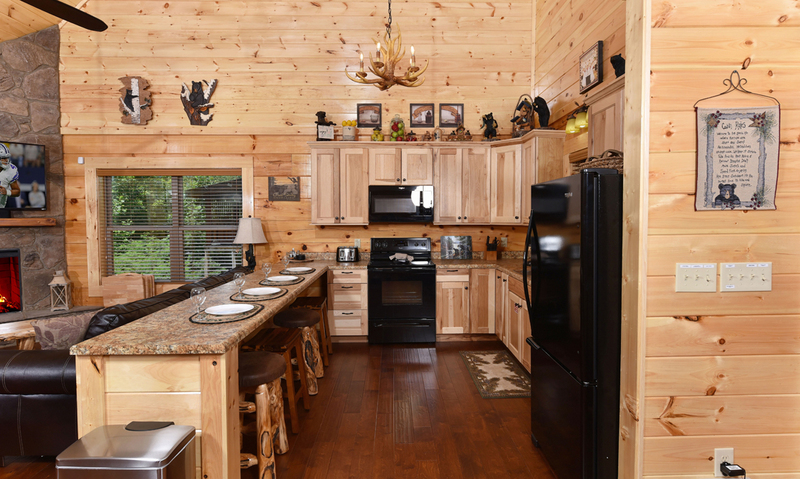 In-cabin meals are made easy at Charlie Brown’s Cabin, with a well-equipped full kitchen featuring sleek, black appliances, custom cabinetry, and an antler chandelier overhead. Enjoy a Colombian blend or green tea at the 4 padded log stools at the breakfast bar in the morning or whip up a nice dinner in the evening with the electric glass-top range/oven, coffeemaker, toaster, blender, and plenty of cookware, dishes, glassware, utensils, and more. 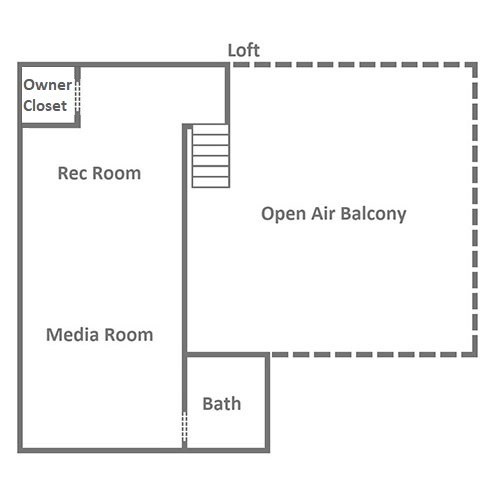 Feel free to set up the dinner trays in the nearby living space and pop everyone’s movie-night favorite or reheat delicious restaurant leftovers in the provided microwave. And don’t forget to let the dishwasher and garbage disposal take care of the aftermath for you! 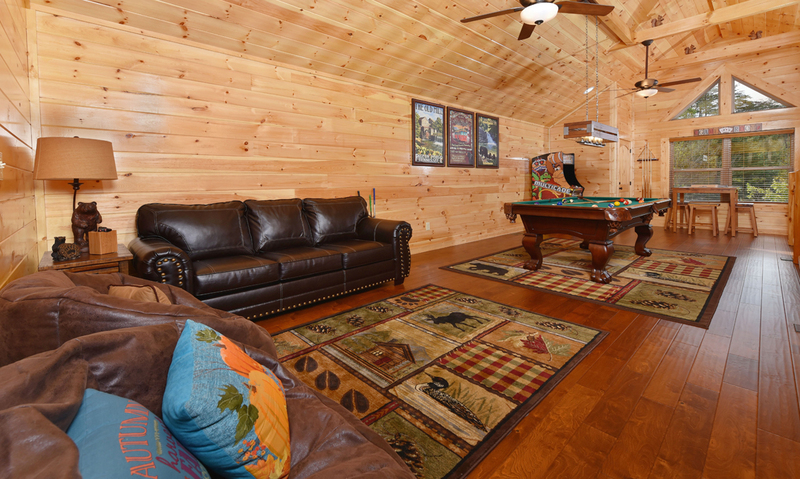 Part rec room, part living room, the loft in Charlie Brown’s Cabin features a family room, 50-inch HD flatscreen TV, DVR and DirecTV, DVD player, and a game area kids and adults will love. 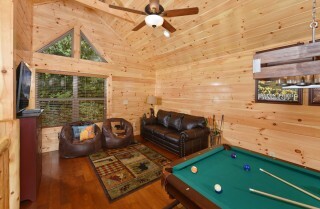 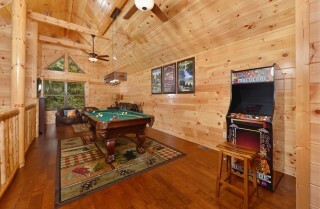 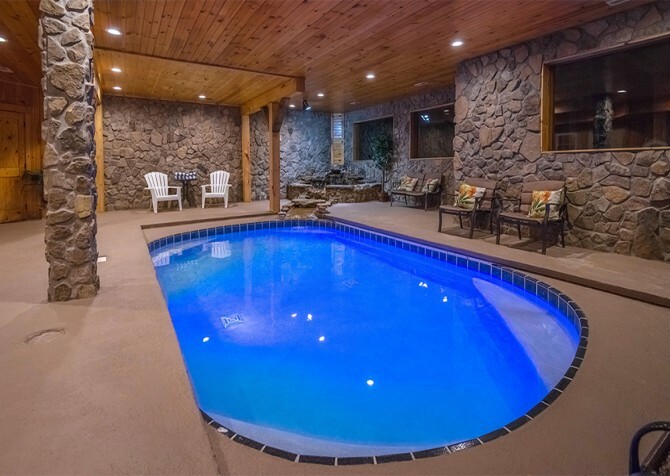 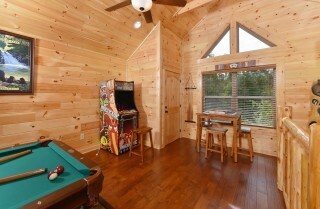 Shoot some pool while you’re hanging out in the cabin, sit down with a drink or a board game at the pub table for 4, cozy up in the 2 Big Joe gaming chairs, play on the new arcade system, and watch a comedy show from the leather sofa. Welcome retreats after big hikes in the Great Smoky Mountains National Park, the bedrooms in Charlie Brown’s Cabin, including 2 master suites on the entry level, have the comforts of home — plus some great extras. 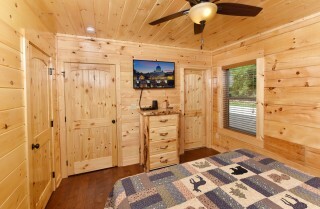 The first bedroom features a king-size log bed set, a full bathroom with a shower and tub combo, ceiling fan, and a 32-inch HD flatscreen TV with DirecTV. 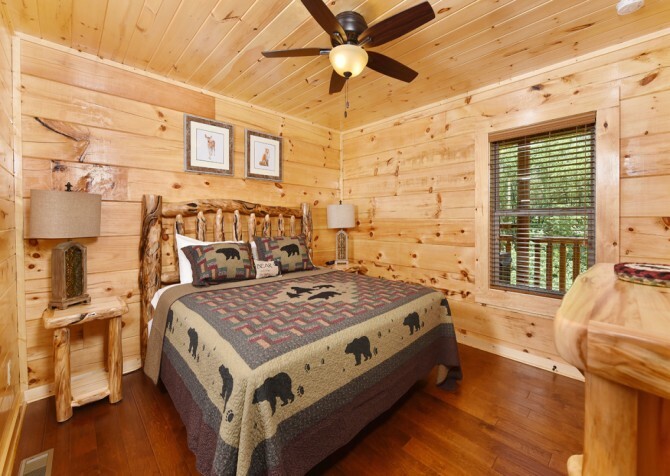 In the second bedroom, find another king-size log bed and ceiling fan, a full bathroom with shower, and a 40-inch HD flatscreen TV with DirecTV. 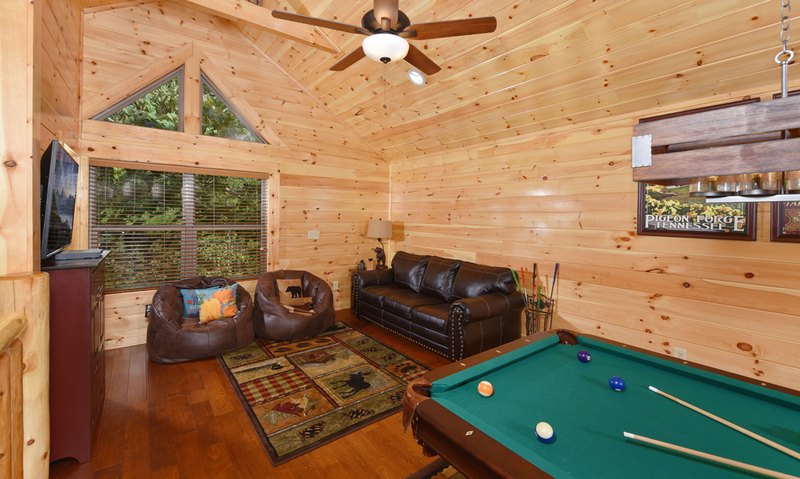 In the loft, a queen leather sleeper sofa offers more space, along with a stand-up shower. Come home to hot showers, relaxing baths, fun shows, and sweet dreams! 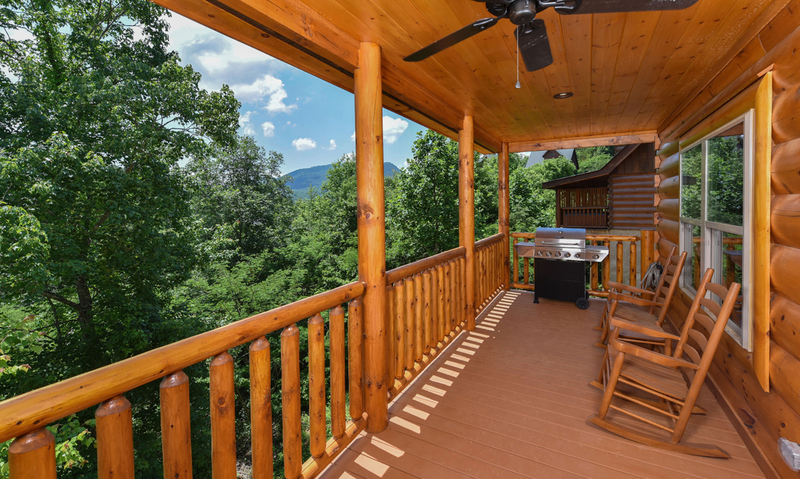 What’s a vacation to the Great Smoky Mountains without some time spent in the great outdoors? Make yourself at home on the covered deck of Charlie Brown’s Cabin, where wooded and mountain views await. 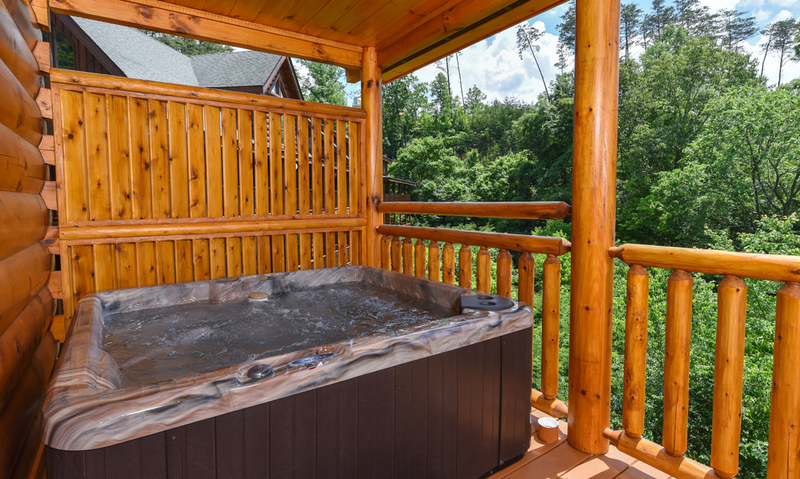 Sit back in the rocking chairs with a drink, switch on the outdoor ceiling fan on warmer days, fire up the gas grill for a cookout, and end your evening with a relaxing soak in the 4-person hot tub. 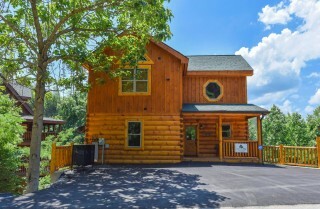 And when you’re ready to hit the town, the paved parking area for 4 vehicles, including motorcycles and a trailer, plus the flat, paved driveway make it smooth and easy. 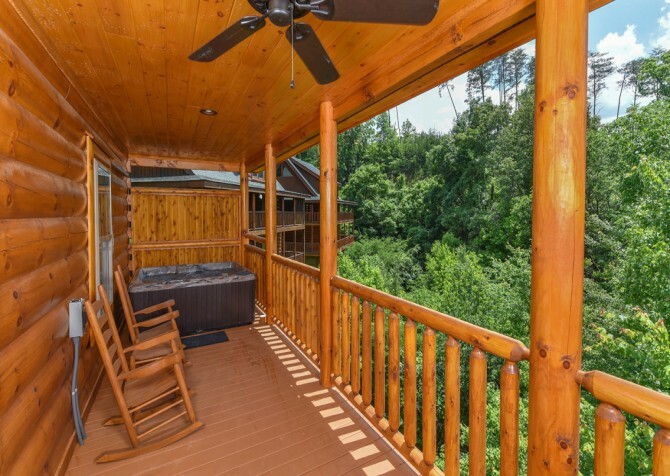 In fact, entering or leaving this log cabin is a breeze with only 1 low step from the drive to the covered front porch, where you can toss your luggage on the bench and effortlessly head inside to explore the cabin as soon as you arrive. Vacations are made easy at this Pigeon Forge cabin, with a washer and dryer to pack light and bring home fresh suitcases, complimentary wireless internet to check emails and search for local deals, blow dryers for styling your locks in the bathrooms, and an iron and ironing board for looking crisp before heading downtown for a nice dinner and show. 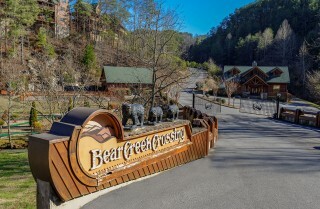 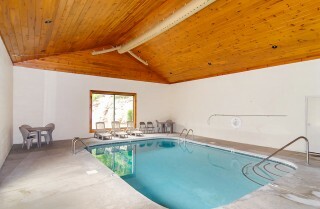 Additionally, as a proud member of the gated Bear Creek Crossing Resort, Charlie Brown’s Cabin provides community access to an outdoor pool with a stunning waterfall feature within view, an indoor swimming pool, and serene hiking trails. While unwinding, relaxing, and playing at the cabin is certainly fun, you won’t regret heading to downtown Pigeon Forge — less than 5 miles away — for local events, exciting attractions, outdoor activities, souvenir shopping, and dining adventures! 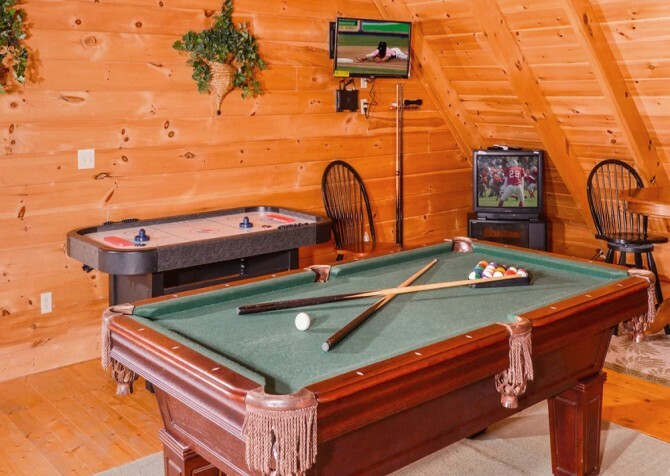 Run into — and take selfies with — your favorite Hollywood stars and celebrities at the Hollywood Wax Museum, featuring Clint Eastwood, Marilyn Monroe, John Wayne, Jackie Chan, and Natalie Portman. Dine on Granny’s homemade meal while cheering for the family you wish to win at the Hatfield & McCoy Dinner Feud, where Southern food and mountain-style antics are the stars of the show! 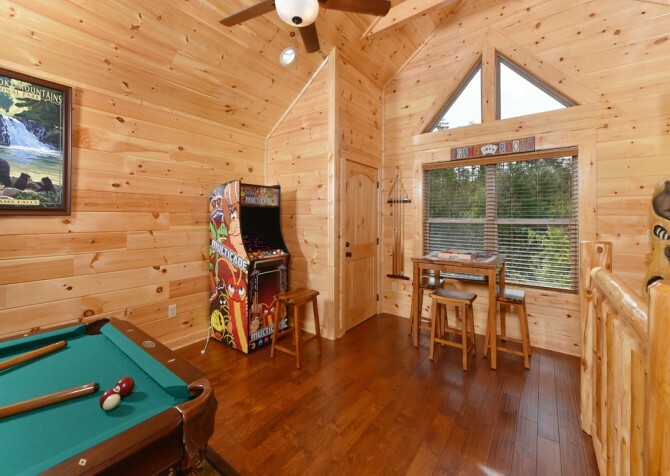 With wands at the ready, channel your inner witch or wizard at MagiQuest, a role-playing game with exciting quests and enchanting adventures around every castle corner. 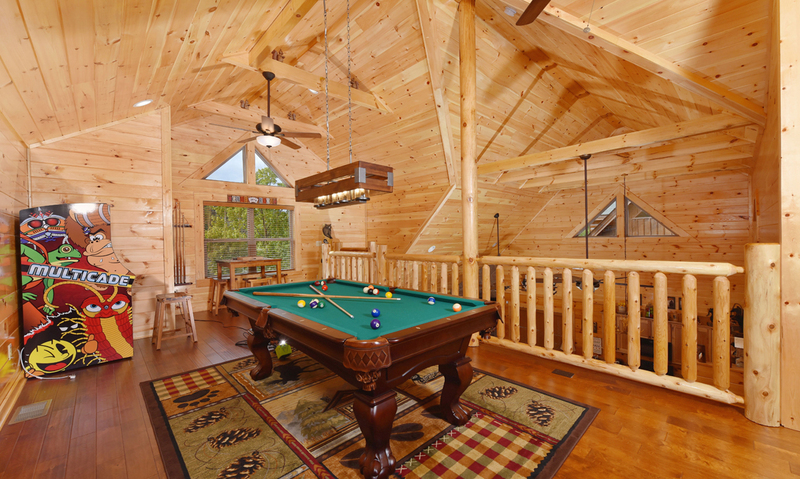 "Great, great cabin. 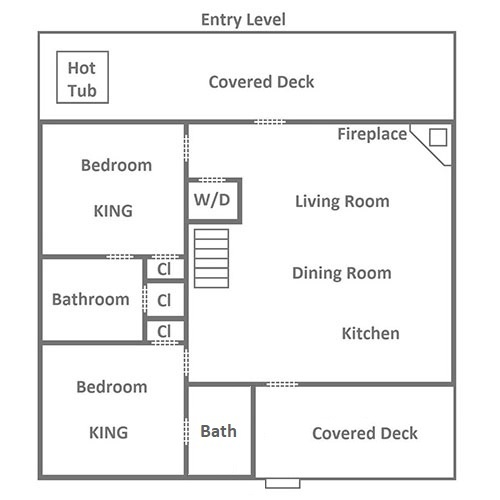 So clean, so organized. 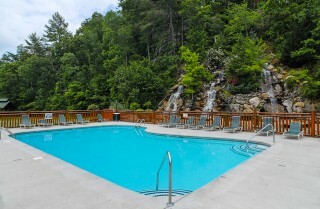 I wanna come back"
Thank you so much for the great review! We can not wait to have you with us again! 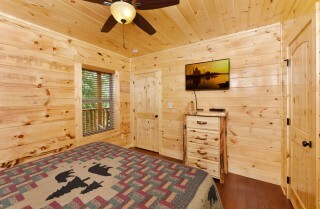 "We stayed in Charlie Brown’s Cabin. 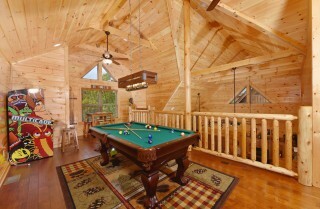 The cabin was absolutely beautiful! And the staff was very helpful!"